That report comes on the heels of a study issued Tuesday by the Geneva-based World Meteorological Organization, which stated that human civilization has pumped roughly 375 billion tonnes, or metric tons, of carbon into the atmosphere since the dawn of the industrial age, when the extraction and combustion of fossil fuels began in earnest. That number, measured against things as they existed before the industrial-scale use of fossil fuels got underway, was not considered absolute. But the best evidence seemed to suggest that keeping the Earth's average temperature from rising much beyond 2 degrees was a worthy goal, not least because larger increases would raise the odds of many unpleasant things: forbidding sea levels, searing heat waves, grinding droughts and the like. In subsequent years, some prominent scientists argued that even 2 degrees of warming would be disastrous. But increasing evidence suggests that such distinctions may no longer matter. Nearly 30 years after the benchmark was proffered, about half the distance to a 2-degree temperature increase, or about 0.8 degrees, has already been achieved. Further, enough carbon dioxide, the chief planet warming gas that arises when coal, oil and natural gas are burned, is already in the atmosphere to raise future temperatures by another 0.8 degrees, even if all the pollution stopped immediately. As it is, atmospheric levels of carbon dioxide are at an all-time high and are projected to continue booming. Carbon dioxide is, of course, naturally present in the atmosphere -- and necessary for retaining some of the sun's warmth and creating a habitable climate. But all that extra, human-produced carbon dioxide is amplifying the natural greenhouse effect, and driving up the planetary thermostat. So much so that PricewaterhouseCoopers, the global business consultancy, issued a report earlier this month that makes the 2-degree Celsius threshold appear quaint. That analysis, titled "Too Late for Two Degrees?," suggested that while efforts to reduce the carbon intensity, or the amount of emissions per unit of GDP, of the world's economies are making some modest gains, they are unfolding so slowly as to be negligible. "Even doubling our current rate of decarbonization, would still lead to emissions consistent with 6 degrees of warming by the end of the century," noted Leo Johnson, a partner in PwC's Sustainability and Climate Change unit, in the report. "To give ourselves a more than 50 percent chance of avoiding 2 degrees will require a six-fold improvement in our rate of decarbonization." Put another way, the PwC researchers concluded, to have even a modest chance of staying within the 2-degree threshold, the global economy would need to reduce overall carbon intensity by 5.1 percent every year for the next 40 years. Atmospheric carbon dioxide concentrations at Mauna Loa Observatory, Hawaii. Reductions in overall carbon intensity have occurred -- particularly during times of steep recession, when economies are producing less and, as such, burning fewer fossil fuels. But reductions of 5 percent have never been achieved in any year since World War II, the PwC report noted, much less year after year for decades. And given the fast-expanding and fossil-fuel dependent economies of countries like China and India, such reductions are exceedingly unlikely, the authors suggested. "Governments and businesses can no longer assume that a 2-degree Celsius warming world is the default scenario," the PwC authors declared. "Any investment in long-term assets or infrastructure, particularly in coastal or low-lying regions, needs to address more pessimistic scenarios. Sectors dependent on food, water, energy or ecosystem services need to scrutinize the resilience and viability of their supply chains." The findings roughly echoed those of the Paris-based International Energy Agency, which suggested this month in its annual World Energy Outlook that even accounting for the policy commitments already made or contemplated by world governments, energy-related emissions are expected to rise precipitously over the next two decades, pointing to what the organization called a "long‐term average temperature increase of 3.6 degrees Celsius. "A lower rate of global economic growth in the short term," IEA reported, "would make only a marginal difference to longer‐term energy and climate trends." Should these bleak scenarios prove accurate, the World Bank said on Sunday, a variety of unpleasant end-of-century outcomes would seem virtually unavoidable: Increasingly acidic oceans that will fundamentally alter the aquatic food chain; rapidly rising oceans; freshwater scarcity, diminished agricultural yields; and a variety of other impacts -- most of them landing particularly hard on the world's poorest. "Lack of action on climate change threatens to make the world our children inherit a completely different world than we are living in today," said World Bank Group President Jim Yong Kim in a statement accompanying the report. "Climate change is one of the single biggest challenges facing development, and we need to assume the moral responsibility to take action on behalf of future generations, especially the poorest," he said. 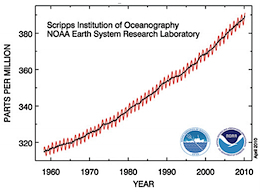 As global warming approaches and exceeds 2-degrees Celsius, there is a risk of triggering nonlinear tipping elements. Examples include the disintegration of the West Antarctic ice sheet leading to more rapid sea-level rise, or large-scale Amazon dieback drastically affecting ecosystems, rivers, agriculture, energy production, and livelihoods. This would further add to 21st-century global warming and impact entire continents. To be sure, no scientific model can pinpoint exactly when any particular temperature level will be reached, nor predict with precision just how the planet will respond. And some experts remain hopeful -- albeit increasingly cautiously -- that dramatic action could still forestall the most dire implications of rising temperatures, though they say the window for doing so will not be open for long. "It is still possible to avoid 2-degree warming, and arguing it is too late could very easily be a self-fulfilling prophecy," said Michael E. Mann, a climatologist and director of the Earth System Science Center at Pennsylvania State University. "That having been said, the real issue is whether or not we have the political will." That sentiment was echoed by Jonathan Koomey, a research fellow at the Steyer-Taylor Center for Energy Policy and Finance at Stanford University, and the co-author of the first comprehensive analysis of the 2-degree limit back in 1989. "We tend to underestimate the possibility for change," Koomey said "At certain times, when people perceive a crisis, things can change very, very rapidly." Koomey pointed, by way of example, to World War II, when initially reluctant automobile factories, under federal orders, converted operations in a matter of months to the manufacture of planes, tanks and other defense products. "People have been able to make very rapid changes," Koomey said, "and I think we have to be very careful in thinking about, or in taking literally, people's assessments of feasibility." Still, he added, "We have to separate the lessons that this way of thinking can teach us and the realities of politics and interest groups. Urgent action is required." The climate activist Bill McKibben, who is currently traveling the country in an effort to highlight the hard math that is making the 2-degree benchmark an increasingly fleeting possibility, agreed. "It would take an incredible effort, but that's what we're trying to spur," he said when asked if the recent proliferation of analyses suggests an inescapably dire future. "Given the damage that 1 degree is doing, we're already at 'dire,'" McKibben said. "We dearly don't want to see what 2 degrees looks like, much less 3." This post has been updated to correct a statistic from the World Meteorological Organization on the amount of planet-warming pollution released into the atmosphere since the beginning of the Industrial Revolution. The amount is 375 billion tonnes, or metric tons, of carbon, no carbon dioxide.